Capitol Hill is one of Seattle’s oldest neighborhoods, and it’s also one of the city’s most haunted. 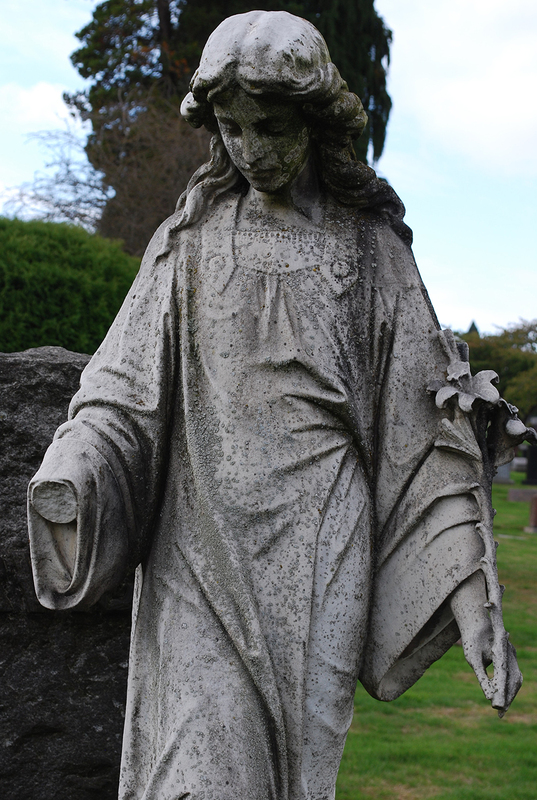 The area boasts several buildings and cemeteries that are oozing with ghosts and paranormal activity. This Capitol Hill Ghost Walk will lead you past ten of those eery, haunted locations. We’ve included photos and descriptions of every haunted spot on the walk, and in-depth directions to help you find your way. 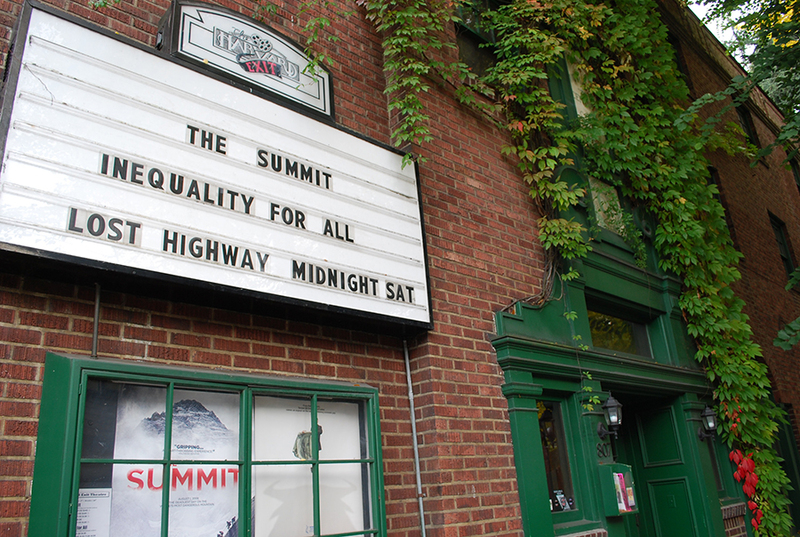 There are several different ways you can approach the Capitol Hill Ghost Walk. You can stroll the seven miles on foot, ride your bike, or drop the addresses into your GPS and just drive from location to location (I’ve also linked maps to the haunted spots). No matter how you do it, just do it! It’s perfect for Halloween fun in Seattle. I recently walked the Capitol Hill Ghost Walk and thoroughly enjoyed it. 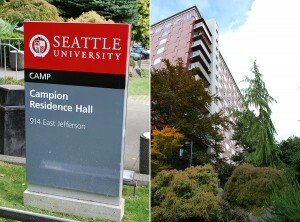 Not only do you get to see the best haunted spots on Capitol Hill, but the directions also lead you through three parks, several nice neighborhoods, and through the Seattle University campus. The walk took me about two and a half hours to finish, but I stopped to take several pictures along the way. Are you ready for the Capitol Hill Ghost Walk?! I can feel you shaking already, so I’ll take that as a yes. These are the haunted locations you’ll see! 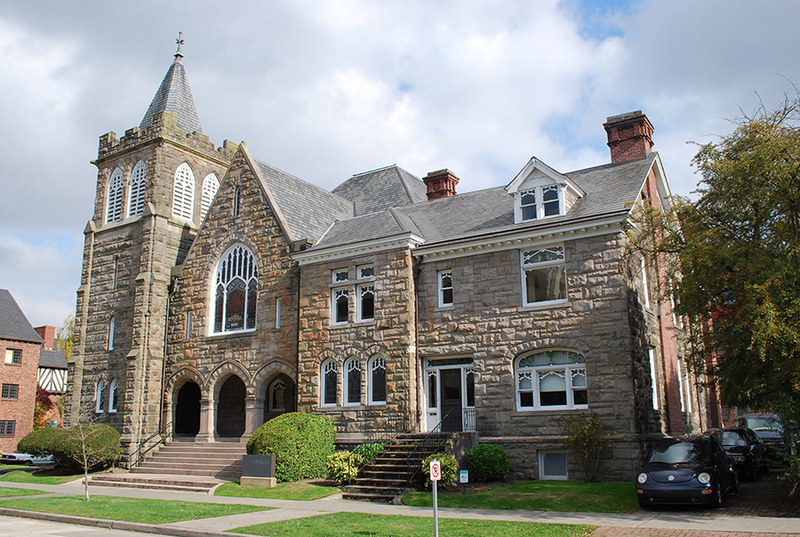 Built in 1907, this building was once home to Broadway High School, the Burnley School of Arts, and the South Annex of Seattle Central Community College. A ghost named Burnley is responsible for loud footsteps and other unexplained noises, pushing students from behind, and even tipping over desks and opening drawers. During the Burnley School of Arts days, the owners invited mediums to investigate the paranormal activity. All three mediums made contact with the ghost of an 18-year-old boy who was killed in 1913 after a basketball game in the gym. He was apparently pushed down the back stairs during a fight. This is considered one of the least advertised haunted locations on Capitol Hill, but many ghostly things happen here all the time. Incidents have included footsteps, glasses moving in the bar (in full view of patrons), and even sightings of a woman on the fourth floor near room 408. Many rumors have swirled about Campion Hall over the years, but the most persistent includes a girl who committed suicide in the third floor bathroom. That might explain why there are so many ghost stories from third floor residents, including loud sounds in empty rooms, the sound of someone running through the hall (only to find no one is there), and even the shower in the third floor bathroom being turned on when no one is around. 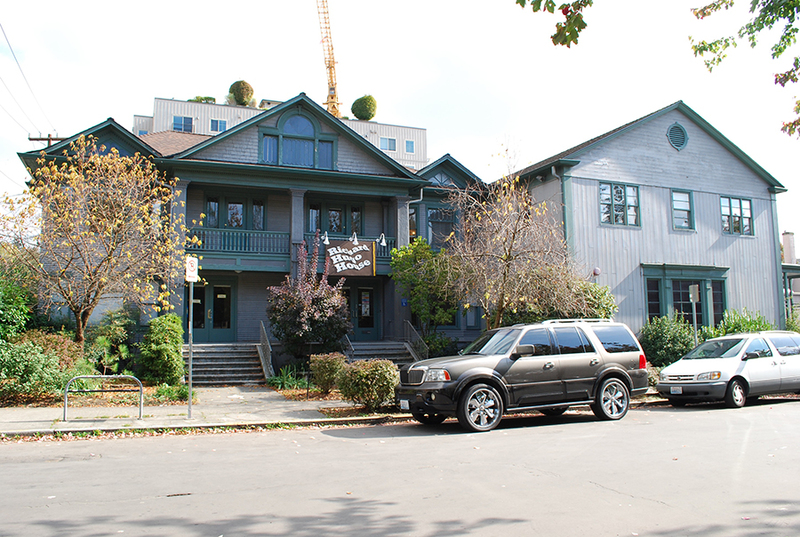 Built in 1902 and now named after local poet Richard Hugo, the Hugo House has been a mortuary, apartment house, and a theater complex. It’s now a popular spot for many local writers…and ghosts. Investigators of the building once found a secret room, which might explain some of the paranormal activity. No one knows what the room was for, so it remains a mystery. The ghosts of Rev. 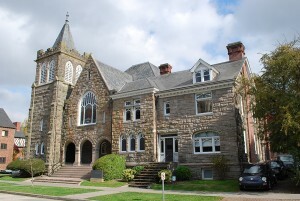 Daniel Bagley and his wife Susannah were often seen in the parsonage of the Old Capitol Hill Methodist Church. Many parishioners felt the spirits, but one former resident claimed to have seen Susannah dressed in a gown, surrounded by a blue light. When she asked, “How do I get out?” He pointed to the door, but she floated out an upstairs window instead. Volunteer Park now sits on what used to be the Washelli Cemetery, which was Seattle’s municipal cemetery from 1884-1887. When the cemetery closed, the bodies were moved to the nearby Lake View Cemetery. The park continued to collect bodies however in the 1970s and 1980s. 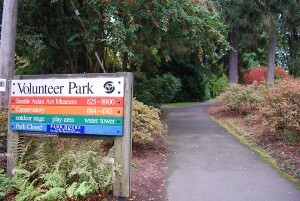 One police officer claimed that more murders happened in Volunteer Park than anywhere else in Seattle during that time period. The park is now very safe, but its storied past makes it a perfect stop on the Capitol Hill Ghost Walk. 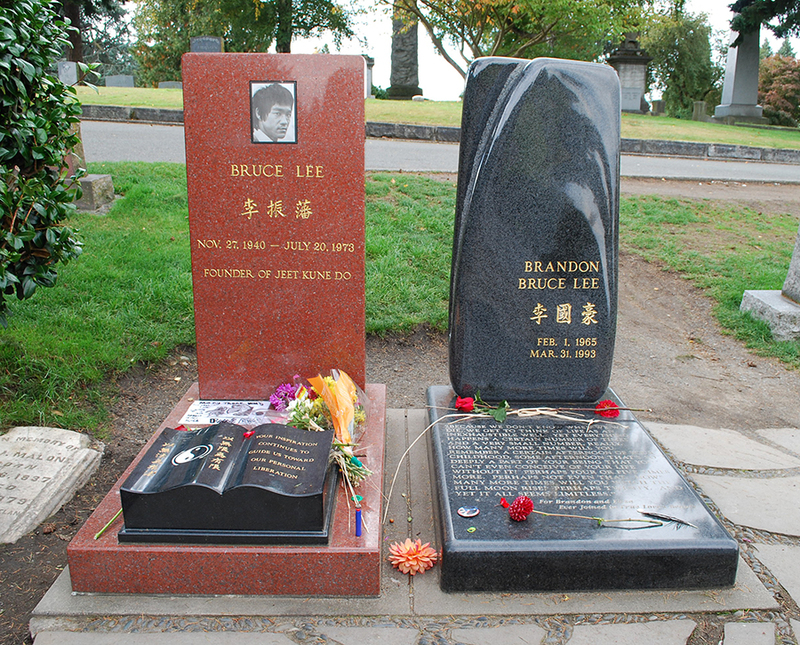 This cemetery is the final resting place for many Seattle pioneers, but it’s most famous for being the burial site of martial artist and cult icon Bruce Lee and his son Brandon Lee. To find the graves of Bruce Lee and Brandon Lee, walk through the main entrance of the Lake View Cemetery (you’ll see it on your left at the end of the fence on 15th). Once you enter the cemetery, take the first left and follow that road. Continue on the path until the road intersects at Eldridge (you’ll see the name written on the ground at the corner of the intersection). Walk straight and branch up to the left at (Major on the left). After a few yards, you’ll see the shiny red and black gravestones to your right. That’s the burial site of Bruce Lee and Brandon Lee. The Grand Army of the Republic (GAR) Cemetery is one of the neatest stops on the Capitol Hill Ghost Walk. 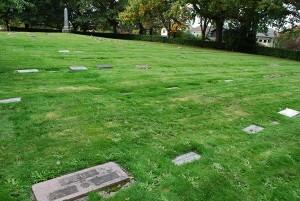 It’s a Civil War cemetery (literally home to Civil War veterans and their spouses), and it’s loaded with ghost stories. Several eye-witnesses claimed to have seen ghosts walking around in Civil War uniforms over the years. This building was once a church, but it’s long been owned by the Daughters of the American Revolution (DAR). Many people have heard strange voices and music playing inside the building. There have even been reports of a female ghost walking down the front stairs in a dress from the 1800s. The Harvard Exit Theatre is one of the most famous haunted locations in Seattle — if not the entire Northwest. Built in the 1925, the building became the Harvard Exit Theatre in 1968. One night, a theater manager was closing up for the night when he heard loud noises and voices on the third floor. When he went upstairs, he didn’t find anyone, but he heard the exit door close. When he tried to open the door, it was held against him from the outside. Once the door became free, there was no one on the other side or in the vicinity. If that’s not enough for you, A group of psychics and parapsychologists once stayed the night in the theater. They put a magnet by the third floor exit door and witnessed a large ball of energy appear, move about the auditorium, and leave out the exit, causing the magnet to revolve wildly. *Descriptions partially provided by the American Volkssport Association, citing information from A Ghost Hunter’s Guide, Ghost Stories of Washington , and The National Directory of Haunted Places . 1) From QFC turn right onto Broadway. 2) At Harrison, cross and turn left (crossing Broadway); continue on Harrison. 3) At 10th, cross and turn right onto 10th. 4) At Thomas, go left and then right to continue on 10th. 5) At Denny, cross and enter Cal Anderson Park. Go right on the park path. Walk through the park staying parallel with the street on your right. 6) Take the first set of steps on the right, going out of the park toward Howell. The Bonney Watson Funeral Home is on your left. 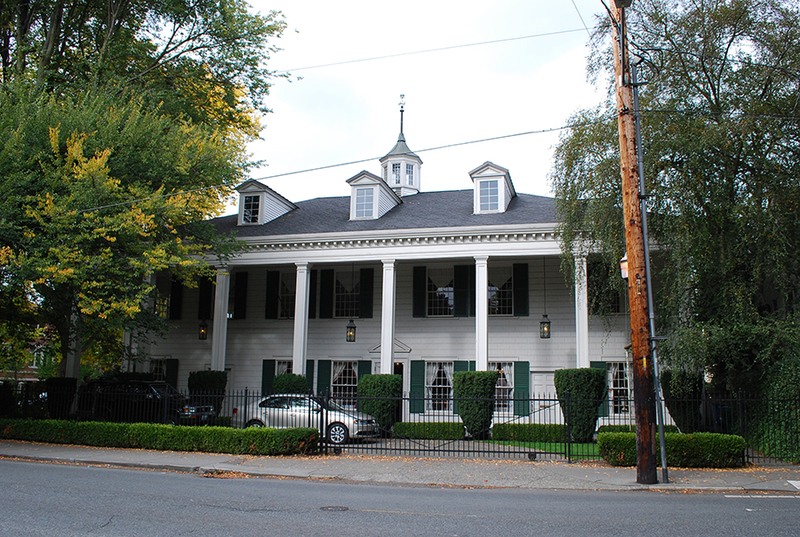 Established in 1861, it’s the second oldest continuing business in Seattle. 7) At Broadway, turn left passing the Broadway Dental Center at Pine. 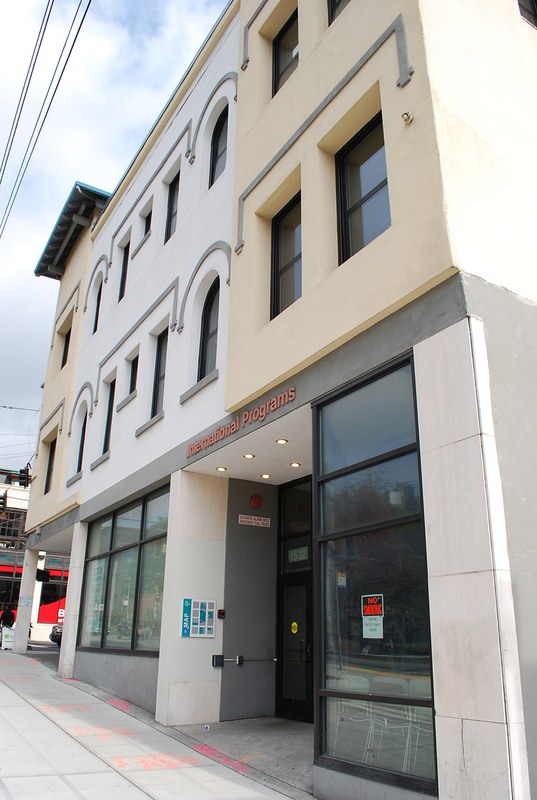 This is where you’ll run into 905 E. Pine Street (HAUNTED SITE A) on the left. Continue to Pike. 8) At Pike, cross and turn right (crossing Broadway); continue on Pike. 9) At Harvard, turn left. 10) At Union, turn right crossing Harvard. Immediately turn left and cross Union. Straight ahead, take the crosswalk that angels left to Polyclinic Building. Continue on Harvard. 11) At Spring, turn right (crossing Harvard) and continue on the left side of Spring. 12) At Terry, turn left (Virginia Mason on right). 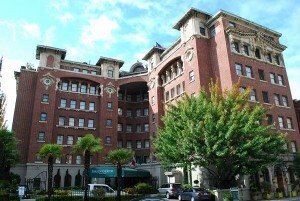 13) At Terry & Madison is the Sorrento Hotel (HAUNTED SITE B). 14) Cross Madison and continue on Terry. Pass the Frye Art Museum on your left; admission is free if you’d like to check it out. 15) At James, turn left. 16) At Boren, cross and turn right; continue on Boren. 17) At Jefferson, turn left. 18) Continue on Jefferson, crossing Broadway, and go downhill. The tall building on the left is Seattle University’s Campion Hall (HAUNTED SITE C). 19) After passing Campion Hall, turn left onto the sidewalk (across from 11th). A cyclone fence will be on your right and the soccer field below. 20) At the end of the sidewalk, turn left and go uphill across to the crosswalk and light. Cross and proceed straight on Cherry. 21) After passing the library, engineering building, and the fountain, turn right downhill toward the university seal painted on the asphalt. 22) At the seal turn left and continue past the Chapel of St. Ignatius. 23) As you exit the Seattle University campus, take the left fork in the crosswalk and cross Madison. 24) Immediately turn right and cross 11th, and then turn left to continue on 11th. 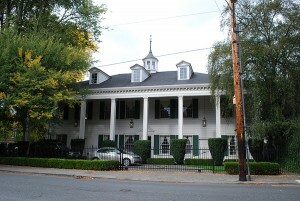 At 1634 11th Avenue (just past Pine) is the Richard Hugo House (HAUNTED SITE D). 25) At Denny, cross and turn right. 26) Continue on Denny, crossing 12th at the crosswalk. Just beyond 14th, Denny curves right to the light. Continue on Denny. 27) At 16th, cross and turn left. 28) One block ahead is the old Capitol Hill Methodist Church, which is now home to a company called Catalysis (HAUNTED SITE E). 30) At Prospect, cross and turn left. 31) Carefully cross 15th at the crosswalk and enter Volunteer Park (HAUNTED SITE F). 32) Turn right onto the first unpaved path that parallels the street and continue through park. 33) Ignore the first exit to the street (at Highland) and continue on the path to the Y. Stay right and exit the park at 15th & Galer. 34) Cross 15th at the crosswalk and turn left. 35) At the end of the fence across the street on your left, you’ll find the entrance to Lake View Cemetery (HAUNTED SITE G). 36) Exit the cemetery and carefully cross 15th. Turn left to enter Louisa Boren Lookout Park at Garfield. 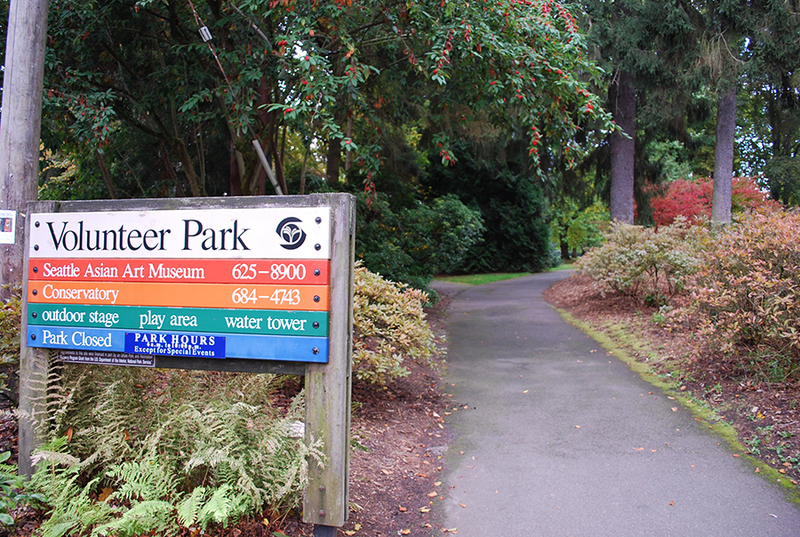 Take the circular path to see the view of Lake Washington. 37) Exit the park at Olin and turn right onto Olin. 38) At 15th, turn right. 39) At Howe, cross 15th at crosswalk; continue on Howe. 40) At Everett & Howe, enter the GAR Cemetery on the right (HAUNTED SITE H). 41) Walk through the cemetery on semi-circular drive, returning to Howe. 42) At Howe, turn right. 43) At Federal, turn left. 44) At Galer, turn right. 45) At 10th, carefully cross 10th and turn left onto 10th. 46) At Highland, turn right. 47) At Harvard, turn left. 48) At Roy, turn left. 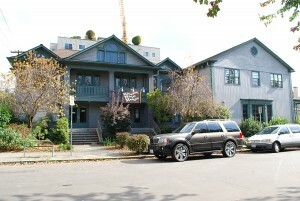 At 800 E. Roy Street is the DAR Building on the left (HAUNTED SITE I). 49) Just ahead, cross Roy at the crosswalk, and turn left. A few yards ahead on the right at 807 E. Roy Street is Harvard Exit Theatre (HAUNTED SITE J). 50) At Broadway, turn right. 51) Continue on Broadway, returning to the QFC. *Directions provided by the American Volkssport Association. We’d love to hear what you think of the Capitol Hill Ghost Walk! Please leave a comment below or connect with us on Twitter, Facebook, and Google+. Don’t forget to also check out Seattle Bloggers for more fun activities around the Emerald City.